Merry Christmas and Happy New Year to the new owners of this wonderful property in Oak Bluffs, Tower Ridge! Sold for $950,000 8 Puritan Drive by Marilyn Moses ! Oak Bluffs: Move right into this custom built home in PRISTINE CONDITION! Offering 5 bedrooms 4.5 baths! 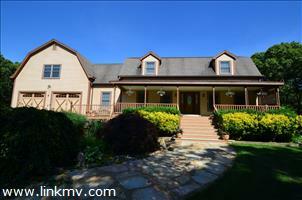 GAMBREL STYLE HOME LOCATED IN TOWER RIDGE ON A 1.20 ACRE LOT SHORT BIKE RIDE TO TOWN! Home is amazingly SPACIOUS THROUGHOUT! Gourmet kitchen with granite counters .. Bright airy open floor plan, great room with gas fireplace .. First floor Master suite.. The second floor offers 4 comfortable bedrooms, full tiled bathroom and a 1 bedroom studio apartment! Incredible finished basement offering an additional 1446 sq ft..Plus a 784 square foot workshop under the 2 car garage! INVESTMENT POTENTIAL FOR RENTALS & large families ! MATURE PLANTINGS AND LUSH LANDSCAPING THROUGHOUT! GORGEOUS THROUGHOUT! MUST SEE!